The owners of Coastal Kitchens & Baths are real estate developers and have worked in the building construction industry for over 30 years. They have always struggled with how their clients had such limited options when it came to actually viewing “model” kitchen displays in various lumber yard “showrooms”. These displays were usually outdated, extremely small vignettes that didn’t provide the client with a realistic sampling of how their “new” kitchen would look & feel. The owners had a vision of a better way to display their cabinetry and a desire to provide the client with a truly professional experience, and Coastal Kitchens & Baths was created with this vision in mind. 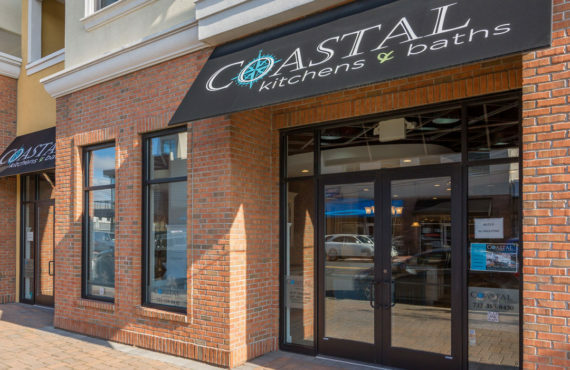 The showroom at Coastal Kitchens & Baths has been recognized as one of the most creative and innovative showrooms along the entire mid-Atlantic. The showroom depicts larger kitchen areas that give a client a “real life” experience. The mixture of product lines provides clients with a hands-on experience when comparing various cabinet lines and countertop materials, and greatly assists clients in making value decisions on their kitchen project. The kitchen design and selection process is truly one of the most important aspects of any new home construction or remodeling project and we are confident that the showroom experience at Coastal Kitchens & Baths, along with the expert guidance from one of our truly talented and experienced designers, will exceed the client’s expectations. Our showroom has become an extension of the builder/contractor as it reinforces the client’s confidence that they are working with true professionals throughout their construction project. The design professionals at Coastal Kitchens & Baths have an extensive resume of kitchen designs. We have developed a state of the art design center, in an effort to make the “Buyer Experience” the best in the industry. Coastal Kitchens has partnered with several industry leaders, including American made Mouser Custom Cabinets and MasterBrand Cabinetry. These relationships have been selectively chosen by Coastal Kitchens in order to provide our clients the best quality cabinetry in the industry. Our Design Professionals will work collaboratively with every client throughout the entire design and installation process, noting every detail to ensure a quality and rewarding experience. Be sure to stop by our Showroom on Main Street in Belmar, NJ! Our design experts will help you create the perfect kitchen or bath. Loretta has been in the kitchen & bath industry for 25 years and has designed at Coastal Kitchens & Baths since 2013. Her initial design training was in residential kitchen design. Earning a certificate in kitchen design followed by a certificate in bath design through the National Kitchen and Bath Association. After 7 years of residential design she worked in commercial design with projects for Coors Brewery in Golden Colorado and Humana Hospital in Denver Metro. Her design experience is broad including projects in Manhattan, NYC. She enjoys the creative process of collaborating with customers in the design process. “I love hearing customer’s ideas and helping them achieve the design they inspired to build”. An accomplished draftsperson using the design program 2020 DESIGN. Loretta was also one of the design team associates for the Coastal Kitchens showroom. She brought new insights to the attention of detail for each display. Her composed demeanor allows her to focus on design solutions to complex issues that can arise during both the design and construction phase of a project. Loretta’s success has been her innate ability to translate a client’s lifestyle, needs and wants into beautiful and functional living spaces. She holds a large referral base and many happy (and repeat) clients. Rachel G. Ford, designer salesperson has been working in the kitchen design industry since 2002. After studying business management at Quinnipiac University in Hamden Connecticut, she returned home to her beloved Jersey Shore to begin her career. Having designed and managed over 150 residential kitchen & bath design and install projects, she knew she found not only her job but her true passion and career. Her hard work and love of design was rewarded in 2010 with a design feature in Signature Kitchen & Bath design magazine. During her time in the industry Rachel had the opportunity to work with major cabinet manufacturers to learn the individual nuances of their main brands, including Kitchen Craft, Mouser and Kemper. Rachel’s design skills are flexible to accommodate any homeowners design esthetic from clean contemporary to embellished traditional with a heavy focus on organization and storage. Each client’s needs are so individual, and yet her ability to bring out the best style & function for each client - making each space an extension of the clients personal style, is truly what separates her designs. Rachel’s infectious smile and perky outlook leaves an impression on all her clients, whom walk away feeling happy and excited for a project sometimes seen as daunting and overwhelming. Thanks for everything. You truly took all the worry out of this project for me and I am so pleased with the results! Everything looks great! Thank you so much for your expertise, quality of work and professionalism.